Electrical system consists of Delta PLC control system and Delta Touch Screen, with data input and output; control system has safety logic control and trouble-shooting functions. Hydraulic System: uses double high-dynamic proportional valves, which automatically adjust the oil flow and pressure, to guarantee the precise movement between the tamper head and mould. Heavy duty machine structure, which is made of high density cast steel, is vibration proof. Four rods guiding system and long guide bushing assure the precise movement between the tamper head and the mould. After Several years effort, CHIRAG has developed over 24 types of high performance, high quality new products with self-owned intellectual property rights in Building Materials Machinery industry. 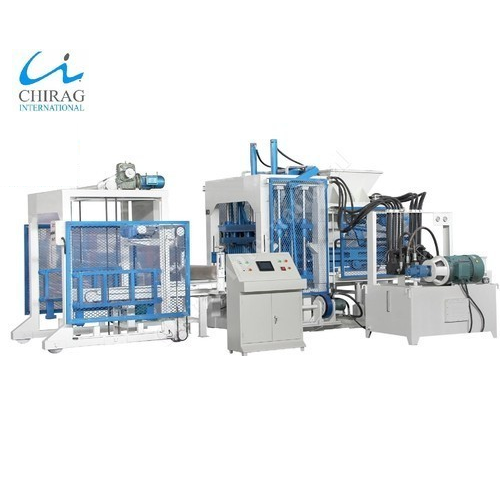 CHIRAG based on the application of Germany frequency conversional technology to block making machines, build up-to its own core competitive advantages in the industry. CHIRAG products won the “Product Patent Award” and “Product Innovation Award” many times and CHIRAG is Top 1 brand in domestic block making machine industry. CHIRAG machines are not only distributed and found in use all around India, but also exported to over 108 countries and areas, including Europe, Asia, Middle East, Africa and Oceania.